It’s time for a much overdue post on my move to BC. I’ve been struggling to figure out what to share with you and I can’t believe almost a month has passed already! 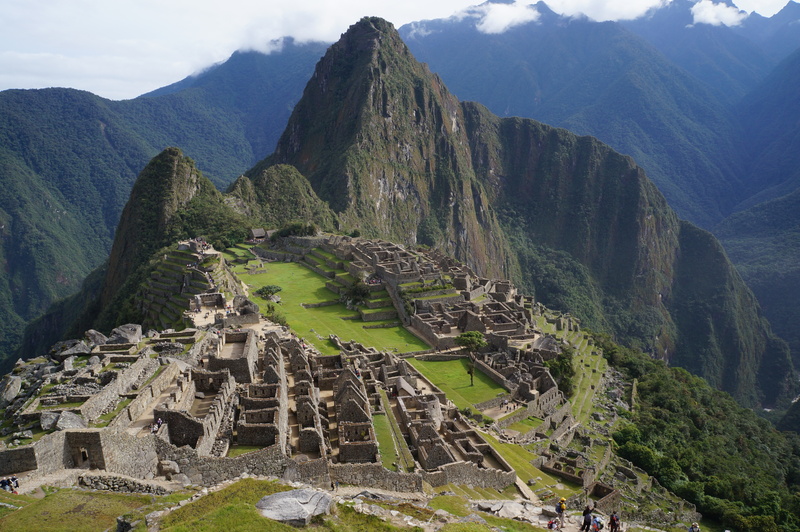 My travels have always been short-term and as a result, I crammed as much sight-seeing as I could into my travels. This move has been different. I’ve spent the last few weeks attempting to settle into my new home and explore my new neighbourhood. As a result, I haven’t even been into Vancouver for more than a few hours. The urgency to make every moment an adventure isn’t really there when you make a permanent move, but let me tell you a little bit about my new home. At the beginning of February I moved into an above ground suite in New Westminster and I started my new job in Burnaby. I’m pretty sure most of my readers aren’t from BC, so let me help you out with the geography. Coming from a small city, I’m not used to having a large metro area that makes up a region. The greater Vancouver area is made up of a number of different municipalities, but they almost feel like one big city. Burnaby is located directly east of Vancouver, with Richmond and Surrey to the south and North Vancouver to the north. There’s a small municipality (approx. 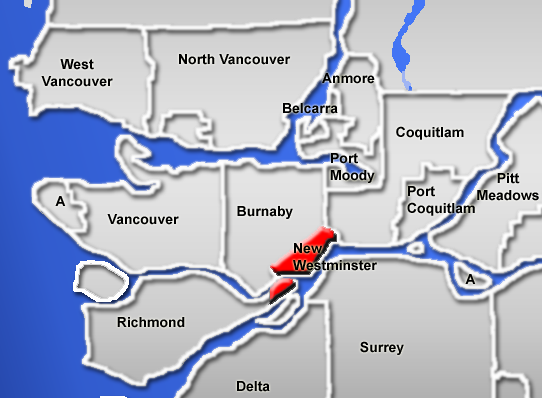 65,000) called New Westminster located on the southeast end of Burnaby next to the Fraser River – this is where I live! New Westminster looks pretty far away from downtown Vancouver, but I live close to the skytrain, so I can get to Vancouver in about a half hour when I want to. The skytrain is basically an above ground subway system – although I enjoy it a lot more than travelling on an underground system because the view is much nicer! So far, I really like New Westminster and I love my apartment! Like I said, it’s an above ground suite and it has lots of big windows, so it’s always bright and it has a pretty big living area. It also came fully furnished, which was a huge bonus and made the move so much easier (and cheaper)! There’s a little bit of greenery around the suite and it’s a close walk to several parks. I’ve spent a bit of time exploring New Westminster and I have discovered that it has quite a bit of history. 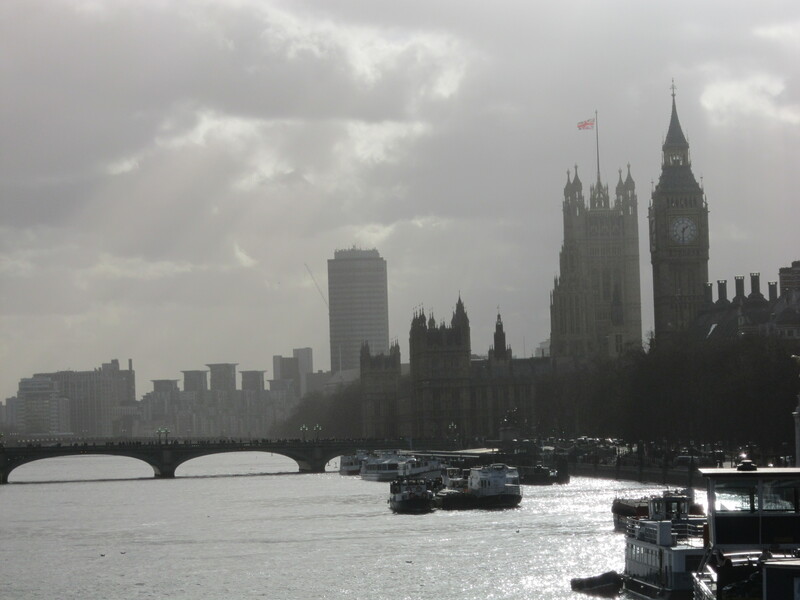 It used to be the capital of BC – named after Queen Victoria’s favourite part of London – and it’s known as the Royal City. 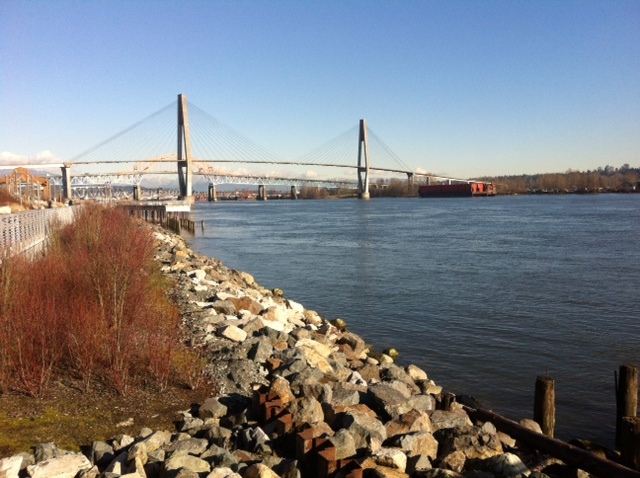 It has a nice downtown area next to the Fraser River and has a huge selection of restaurants to choose from. Thus far my favourite discovery has been the River Market, although it’s one of the bigger attractions, so it’s probably not the biggest discovery. The regular market space is open every day, with several delicious food kiosks and shops to choose from, and every second Saturday in the winter there’s a farmers market held there. Seth and I did make a trip out to Granville Island over the weekend to catch up with a friend and discovered another great food market (although it’s a bit too far from where we live to visit on a regular basis). Granville Island is filled with small shops where you can find lots of fair trade and locally made knick knacks that you never knew you wanted. The food was definitely my favourite though and we all gorged ourselves on delicious treats from the food stalls! We also had a big surprise with the weather this past weekend. The weather in Vancouver seems to either be sunny and chilly or damp and warm. However, this weekend we finally got some snow! I haven’t seen any snow since arriving in Vancouver, but it started snowing overnight on Friday and hasn’t stopped snowing since. I’m going out snowshoeing tomorrow evening and I’m hoping to get some nice pictures from Mount Seymour, so stay tuned for that! Missing everyone back home and would love to hear from you! Vancouver is one of my favorite place to visit at my traveling.